GK Restaurant - functional template restaurant themes from design studio GavickPro. 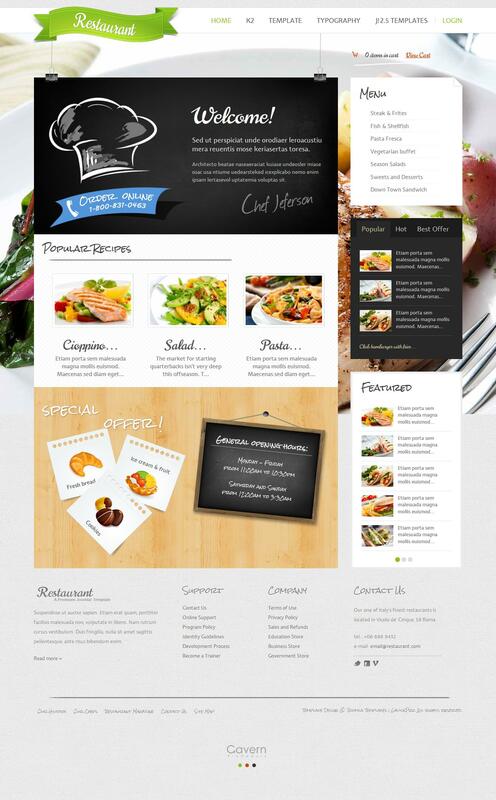 The unique design of this template is perfect for creating websites bars, restaurants, cafes and pizzerias. Having the support component K2 and K2 Store will give an opportunity to organize your online store to receive orders and payment from customers directly through the site. The main features of the pattern is worth noting integration with social services, upload images to the site as you scroll the site in the browser and support for popular extensions Developer: News Show Pro GK4 and Tabs GK4. The template provided 3 colors (green, orange and black) with the ability to change the background image. Powerful platform Gavern Framework provides fast loading pages.